My Parents’ Work / Life. Erfurt, right at the geographical center of Germany, 300 km south-west of Berlin and 400 km north of Munich, is one of the most intact medieval cities in the country (surviving WW2 with little damage), situated on the Via Regia, a medieval trade and pilgrim’s road network – and still to this day, its central location makes it a logistics, trade and media hub for Germany. The university was founded in 1379, the first within the geographic area which constitutes modern-day Germany, and its most famous student, and the most famous Erfurter to this day, haha, was Martin Luther. Tourist attractions include the quaint Krämerbrücke (Merchants’ bridge), the majestic ensemble of Erfurt Cathedral and Severikirche and the towering Petersberg Citadel, one of the biggest and best preserved town fortresses in Europe, which is where my parents’ neat, whitewashed office is located between grass-covered walls, old cherry and chestnut trees and large official buildings overlooking the lively cathedral square, where their new flat is being built in a complex right next to the holy houses. The flat will be done in August, and until then, they are staying at a hotel next to the citadel – just as they’ve been doing for years. I grew up in Denmark, and they still have their home there, in Juelsminde, but most weeks, from Monday to Friday, my dad is here – and sometimes my mum is with him. When they can move into the flat, the idea is that she’ll be here more as well, which will be great for them in all kinds of ways. My dad is looking forward to being able to walk home for a lunch break – my mum’s good food followed by a nap. The square is always very lively – the hundreds of benches of the Biergarten adjacent to the cathedral and church ensemble are always full of merry people, and in front of those three entertainment giants, the cobbled plaza itself is host to farmers’ markets as well as frequent concerts and theatre performances. To complete the idyll, the tram has its track along the perimeter of the square. 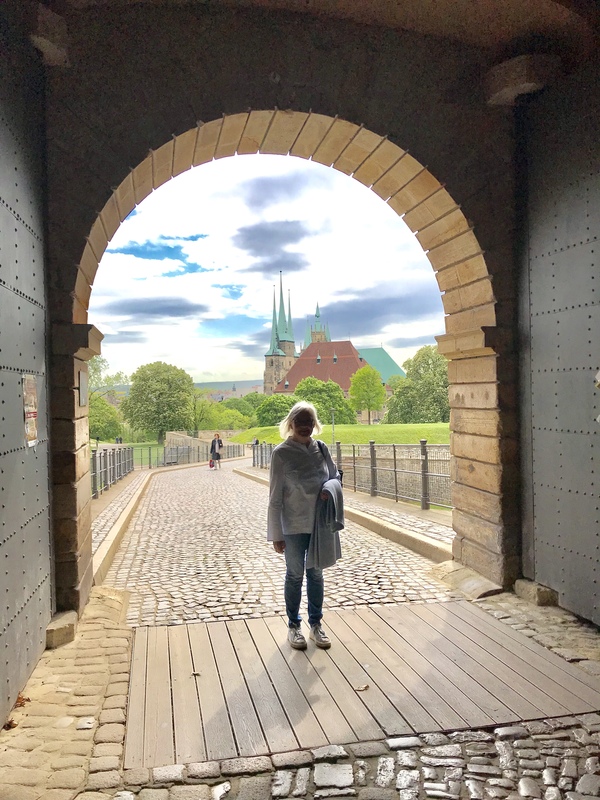 In Juelsminde, my parents’ flat sits on a calm, blissful beach; here in Erfurt, they want to feel human energy on their doorstep – and be close to the relatively tranquil citadel. It makes me smile to see how my mum’s great eye, care and sense of details have had an impact on the design of the office – the choice of art, the light, streamlined furniture, the incredibly lush and well-nursed Pilea P and other plants. I get my own desk and work from here Monday-Thursday this week (Friday, we’re in Denmark). It’s the first time I’m here, and I enjoy it so much – the opportunity to get a glimpse into my parents’ everyday life. Even though their company plays a big role in our family and always has, I usually only contribute from afar (helping with various content-related bits and pieces) and hear them talk about it on the phone or on family vacations. It’s wonderful to experience it all firsthand, and to sense how much they love that I’m here to experience it all – meet their staff and various business partners, get a sense of their day-to-day tasks and various projects and take part in a big event happening in a small village in the forest-covered mountains outside of town, where my dad charms everyone with a clever, funny speech. Both of them are so impressively positive, creative, dedicated and productive: they’ve really thriving here, have been successful at building up good professional relations and are slowly getting to know the city around them as well. Role Reversal. On our lunch breaks and after work, we wander around the Altstadt (Old Town) of Erfurt. My parents hurry me along to eagerly show me All of the Good Things, their favourite nooks and crannies in this city that’s got more than 1260 years of history and a decent mix of well-kept medieval and hip modern elements. Extremely diligent and organised professionally, my parents are mostly laid-back and chilled in their free time. They like being spontaneous and taking things as they come; especially my mum prefers to act on ‘what we feel like doing’ at any given time. Whenever we’ve been exploring cities together – Copenhagen, London, New York, Singapore… I’ve always been the one planning and rushing everyone along, almost trying to hide my ambitious itineraries knowing that they would give my mum an allergic reaction, haha. It’s lovely for both of us to experience a bit of a role-reversal: she has been looking so much forward to showing me everything – this hip coffee shop (Epitome Coffee), these cute old boutiques (such as Goldhelm Schokoladen Manufactur), that wonderful bookshop covering three floors, this exciting art gallery, these idyllic streams with ducks swimming around in them, that charming little plaza, her favourite clothing and shoe shops (we each buy a pair of pink jeans and pink Birkenstocks)… she has booked tables at different delicious restaurants for each night, such as Zumnorde and Ballenberger, where she knows and chats with the sweet waitresses. Our mornings are pretty quick: 6am run around the citadel, 7am breakfast at the hotel, work from 8am. But the evenings are long and lovely. We chat as we eat our asparagus, the kings of all dishes these days as they’re in season, and then we wander along the picturesque narrow streets under the fragrant, blooming lilacs and chestnut trees. Big groups of young people are hanging out along the streams with their legs stretched out to almost touch the water, chatting, laughing, drinking local beer (and smoking pot). On Walpurgis Night, we watch the gigantic Maibaum and Maifeuer and hundreds of witches and devils dancing and prancing around the two from our perfect vantage point, the citadel. Now everything is a bit more real, now that I’ve been here and experienced it all, my mum says. I know exactly how she feels. Juelsminde. Home is where my heart is, both in the sense that it’s where the ones I love are but also quite literally where I physically stand, run, swim, sleep… at any given time. That said, though, there’s definitely something extra homelike about this little corner of the world, regardless of the time of year or level of visibility. When arrive in Juelsminde at 10pm on Thursday, the sun is only just starting to slide down to kiss the ocean good night. We unpack the car, do a few hours of work by the kitchen bar, my mum having shown me her new plants on the balcony and my dad having picked up a nice bottle of wine in the cellar. Around midnight, we head back out on the balcony to breathe in the salty air and listen to the waves hitting the beach below us, such a soothing sound. At dawn, I run along the beach, up among the summerhouses, around the perimeter of the marina and back home again, where my parents have got tea and soy yoghurt with fresh fruit ready. I work from home until the late afternoon, chatting with my mum now and then and enjoying her wholesome homemade lunch. After work, my dad and I drive to Aarhus to say hi to my brother and borrow his corgi puppy Alfred. When we get back to Juelsminde, my mum has prepared dinner (her food is my favourite in the world – always so carefully and lovingly and creatively prepared, always seasonal and healthy, always so full of flavour and structure). We all, apart from hyper-active Alfred, fall asleep on the couch. As soon as I wake up on Saturday morning, I take Alfie out for a sniff-filled wander along the beach – walking a sweet, positive, curious, active dog is one of my absolute favourite activities. We all, including my brother, spend the rest of the day at my cousin’s wedding, and on Sunday, I hang out with my parents and grandparents. Late in the evening, my dad jets to Germany in his own plane, while my mum drives me to the airport, both of us singing along to our favourite Danish pop songs from the ’80s and ’90s as the setting sun casts an orange-red glow across the country roads. Back when I lived in London, we’d always get a bit sniffly at this point, whereas now, a trip to London is nothing but a hop and a skip across the pond – and then I’ll be back in a week. I’m glad I planned to spend next weekend in Denmark as opposed to flying straight back to Singapore from London. Saying goodbye to my parents will always be among my least favourite things to do, and this week we’ve just spent together, in Erfurt and Jutland, has just been so valuable to all of us. London. I love London and am glad I get to spend next week there – staying with friends, meeting friends for breakfasts, lunches and dinners all over town, cycling to and from work along a well-known path between East and Central, spending my days in the beautiful Soho office with my lovely colleagues… sliding back into my old life there, even just for a brief moment. As the Stansted Express train pulls into Liverpool Street Station, at 1:30am, I instinctively think to myself, ‘how can anyone leave London (when they’re not tired of life)? ?’ I do know why, though, I realise as I pull my bags through the old, too brightly lit platform for the 100th time, and I don’t know if London would have had the same appeal if I’d stayed, and I do know that I wouldn’t trade the past two years of living in the tropics, meeting Sanoop and discovering a world with him for anything. The initial thought shifts into a deep sense of gratitude: I’m thankful for my five years’ worth of memories from living in London and for the opportunity to come back now and then to rekindle those – and create new ones.